Recently Foxnews.com published an article on kite traction titled "Kites Inspire New Extreme Sports". The author contacted me and we conducted an interview supplying her with info and photos. Sadly, the article turned out much different than I expected focussing mostly on the dangers of kite traction sports. I looked over my original comments to see if I may have misdirected the author, but I think she already had her angle worked out in advance. Overall a disappointment and unwanted bad press, but in the end it may send people to the right places to get the good info. So, to clear up any misunderstandings regarding this interview, here are my original comments grouped into categories excluding the interviewer's questions/statements. People have been involved in various forms of modern power kiting since the mid 80's. For me it began on a windy day at the local high school field when we tried standing on pieces of cardboard skiing across the grass pulled by a large stack of kites. This was 1987 and by the end of summer we had taken our new fancy from grass to water employing a friend's ski boat to follow us around the lake as we kite-wakedboarded from shore to shore. In those days it was not possible to go upwind so eventually we needed the boat to bring us back to our starting point. We would continue playing on the water for years and performing demos for the local kite club whenever the opportunity arose. I started testing kite traction on land with a pair of Rollerblades in 1990, and others with the same idea spent the non-competition time at kite festivals kite skating in the parking lots. Small crowds would gather to watch us skate, but when Peter Lynn invented the kite buggy that could sail across the grass, folks would no longer come out to the parking lots choosing instead to watch the buggies ripping across the kite fields. I started thinking of how I could bring the kite skating experience out to the kite field. Although a buddy started using a tank-tread type of skate, I found it much too slow. So I removed the wheels from a child's scooter, mounted them onto metal rails that bolted neatly to my Rollerblade boots and took to off-road kite skating like I'd been waiting my whole life to do so. From 1991 to 1993 a growing number of kite buggiers took up the sport, but I remained alone on skates at many of the fledgling buggy events. In 1994, at the Kite Trade Asso. tradeshow in Vegas, kite guru Corey Jensen hosted the Buggy Boogie Thang and for the first time, nearly 300 pilots were on the dry lake at once. Since then buggying has grown at a moderate rate in the US, but has spread quickly to Europe and the UK. Official races have been established and the Enduro style race has become most popular. I developed the Enduro concept of racing around a large rectangular course (up to 2.5 mile around) for a distance of 50 miles or more at the Bonneville Buggy Enduro back in 1994: www.doomwheels.com/articles/bbe.php This concept is used more and more at events like the SBBB (now NABX www.nabx.net). Since the latest kite surfing boom (this time evolving from windsurfing and wakeboarding), people have brought the concept of surfing to the land by kiting with a mountainboard. Now at each land traction event you can see large groups of landboarders and a growing groups of kiteskaters zipping around amongst the more popular buggies. Each group has brought a special flair to the sport and helped to increase the awareness and popularity of power kiting as a whole. There are several major types of kite traction sports... kite buggying, kite skating, kite landboarding, kite surfing, kite skiing/snowboarding, kite jumping, and man lifting. Each sport has its own gear requirements. Buggying, skating, skiing and jumping often use 4 line parafoil style kites. Most skates are homemade and ATB boards and buggies can be purchased at most kite and off-road sports stores. Quadline foils are ram-air wings similar to a paraglider or trick jump parachute. The cells are filled with air inflating the kite and giving it a specific shape. They are flown at about 30 meters and controlled by pivoting a pair of handles, each with 2 lines. Pivoting the right handle pulls in a brake line on the trailing edge of the kite and causes it to turn to the right. Pivot the left handle and the kite goes left. These kites can perform loops, fly forward or backward, and take off and land at will. Surfing and landboarding often use inflatable "tube" style kites that are water launchable and develop more upward lift for big-air tricks. Back in 1987-88 we used a stack of 2 line kites (stack = several similar kites linked together in a train that all fly together as one unit for more power) to kite surf with a wakeboard. In concept, this has not changed much, but our equipment back then only allowed us to surf at about 45 degrees to the wind. We were not able to go upwind, so we needed a chase boat to bring us back to the starting point. It continued like this for years with only moderate improvements. Even the first water launchable kite was not very controllable and only a novelty best suited for belly boarding. Then in '97-98 great improvements were made to water kites and people involved in windsurfing and wakeboarding saw the potential. At a time when both windsurfing and wakeboarding had passed their prime, big manufacturers like Neil Pryde and Naish, and sponsors like Red Bull got involved in kite surfing. Major financial backing is something the other forms of land kite traction has never had, but with it, kite surfing boomed and can now be seen on beaches all around the world. There are professional competition tours, training camps, and several major manufacturers. The gear continues to increase in quality and safety and the trick maneuvers stretch the limits of thrill and innovation. Although many people like myself have been involved in various forms of kiting and power kiting since the 80's, we were not able to promote our sport in the way that the new group of kite surfers have. Some of us have been kite surfing for years, but had little to do with its recent success. This is why I say that the latest birth of kite surfing is more an evolution of windsurfing and wakeboarding than of kiting. It is funny to bridge the 2 groups. Kite surfers are only just becoming aware that power kiting even existed before them. Kite buggying is a form of landsailing. You sit in a 3 wheeled buggy that you steer with your feet and use the kite to develop the power. Like all forms of kite traction, you can sail upwind, downwind, and side to side at speeds 3-6 times that of the wind. These are the newest generation of skateboards used in off-road or all-terrain conditions. They use large wheels and wide skateboard trucks. They also use bindings or clips to secure your feet to the board. Generally they are for skating down mountain trails, but work very well with kites. Check the Doomwheels Kiteskate Gallery for some landboarding pics: www.doomwheels.com/gallery/kiteskate.php there are some on the 2nd and 3rd row of pics. 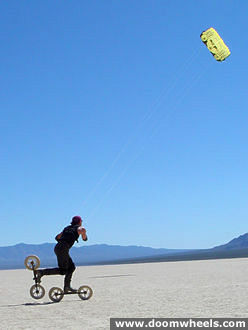 People use off-road mountainboards to replicate kite surfing on land. Kite surfing has become so big that it has shot-off this new aspect of land traction for those who are landlocked or simply prefer the experience of standing on a board rather than sitting in a buggy. Kite jumping is when someone uses a power kite or stack of kites (several kites linked together that fly as one collective group for added power) to lift the pilot into the sky. A kite jumper digs in and drives the kites through the center of the power zone then turns quickly upward yanking him off the ground. People can jump up to 30 feet high and cover a distance of a over a hundred feet sometimes performing flips and twists with their bodies. This is surely the most dangerous of all kite traction sports and often leaves enthusiasts with broken bones. Kite jumping should only be performed on soft sand. Man lifting is a far more controlled method of using kites to carry someone into the air. A tether is used to secure the kites to the ground (usually mounted to a truck), the pilot straps into a body harness that is half way between the tether point and the kites. Once the kites take off, the rig lifts the pilot into the air and carries him from side to side as he controls the kite's flight path. The appeal of power kiting is different for each person you ask. For some it is the all out speed and power. For some it is the sense of motion using only the force of the wind. I personally like both depending on the conditions at the time. On days that the wind is cranking, I like to load up and haul across the desert dry lake at 60+ mph. Towards sunset as the wind smooths out, I like to float across the deck at a comfortable speed and lean far out against the pull of the kite. Kiting in all forms is popular worldwide, but kitesurfing is most popular in Europe, Australia, South America, and US mainly in Hawaii, Southern east coast and the entire west coast from Baja to Washington (starting to grow on the Texas Gulf). Kite surfing and landboarding has brought in the youngest group of power kiters. Kite surfing is a competitive sport attractive to kids 15 and up. The masters are usually in their early to mid 20's. Other forms of kite traction attracts folks of all ages, but I'd say most are between 25-50. The guys that have been doing it the longest are 30-40's. I am 42 and have been skating/buggying for 13 years and surfing for 15. Anytime you strap yourself to a kite up to 7+ meters wide and power up to 70mph (land record) or jump 30 feet above the water hanging upside down with no hands, there is a risk. But for some, that is the kick. It's true, there have been accidents, most of them related to kitesurfing, but overall we are a relatively conscientious group. Even buggy pilots occasionally get pulled up out of the buggy and dropped on the deck. That happened to me last April while racing in the California desert. As I rounded the course marker and headed upwind, a sudden gust lifted me nearly 20 feet in the air while traveling at least 40 mph. I survived this episode better than the truck that got slammed by my runaway buggy. So, I guess the organizations that provide insurance to riders may have a poor impression of our sport and in fact some beaches have been closed to kitesurfers in areas that have reported injury or misbehavior, but most of these closures are due to lack of knowledge of the sport and its safety measures by beach administrators. However, I feel we still have a ways to go in providing safe racing conditions at race events. At the moment, these events are not required to carry a primary insurance policy believing that secondary policies provided by sanctioning kite organizations are enough. But I feel we need better insurance requirements and hope for a change in the near future. I've heard of some in Hawaii and Washington/Oregon area. In Switzerland, they tried to close all lakes in the country to kite surfing, but backed off as the result of signed petitions. Now only designated lakes are available. Note: there are no lake restrictions for winter kite skiing or snowboarding. Better technology and design quality allow kiters to better enjoy the experience of kiting in all forms, but kiting as a whole has seen its ups and downs over the years. Sport kite competition has been declining for years. Even kite buggying has only seen a modest boom since the mid 90's. But kitesurfing has welcomed a new generation of kiters to challenge the wind. Of course, single-line kite artists will tell you they've been doing this their whole life as the masters before them. Regarding the evolution of kiting... this subject would take hours to describe starting in China 2000 years ago. Event kite traction could be dated a couple hundred years ago when George Pocock introduced his kite-powered carriage (the Charvolant). But modern power kiting has crept up out of notable events like when Peter Lynn designed the kite buggy and simple events like our little cardboard surfing incident. Thousands of similar experiences around the world have helped expand our sport to the level it is today. I believe where it goes from here will be truly amazing!